James A. Owen has been working professionally as an illustrator and storyteller for more than two decades. Read “A Brief History of the Geographica” and sample chapters at James A Owen’s website. CLICK HERE FOR MORE BOOKS BY JAMES A. OWEN. The Chronicles of the Imaginarium Geographica — (2006-2013) Young adult. Publisher: The Imaginarium Geographica “What is it?” John asked. The little man blinked and arched an eyebrow. “It is the world, my boy,” he said. “All the world, in ink and blood, vellum and parchment, leather and hide. It is the world, and it is yours to save or lose.” An unusual murder brings together three strangers, John, Jack, and Charles, on a rainy night in London during the first World War. An eccentric little man called Bert tells them that they are now the caretakers of the Imaginarium Geographica — an atlas of all the lands that have ever existed in myth and legend, fable and fairy tale. These lands, Bert claims, can be traveled to in his ship the Indigo Dragon, one of only seven vessels that is able to cross the Frontier between worlds into the Archipelago of Dreams. Pursued by strange and terrifying creatures, the companions flee London aboard the Dragonship. Traveling to the very realm of the imagination itself, they must learn to overcome their fears and trust in one another if they are to defeat the dark forces that threaten the destiny of two worlds. And in the process, they will share a great adventure filled with clues that lead readers to the surprise revelation of the legendary storytellers these men will one day become. 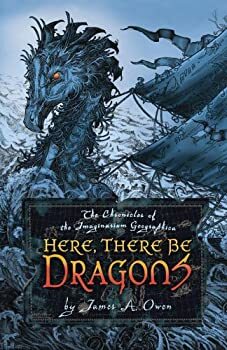 An extraordinary journey of myth, magic, and mystery, Here, There Be Dragons introduces James A. Owen as a formidable new talent. The first thing that comes to mind when I read Here, There Be Dragons is that it's dual-layered. On one hand, it's your typical young adult fantasy where the protagonists enter another realm and end up saving it (although James A. Owens breaks convention by having a much older demographic as its heroes). On the other hand, more knowledgeable readers will catch various literary and mythical allusions that the author sprinkled into the story. This is very much a young adult book, especially since Owens dives into the action quickly and the narrative is sparse when it comes to descriptions and detail. It moves at a quick pace, the suspense is steady, and every chapter has an immediacy to it. Older readers will probably be tickled by Owens's various references and the true identity of its main characters. 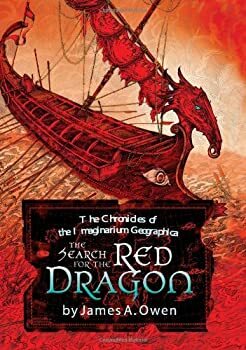 The previous Chronicles of the Imaginarium Geographica book, Here There Be Dragons, had a clean ending, but The Search for the Red Dragon introduces a new conflict that's tied to the original adventure. The strengths — and weaknesses — of the first book continue in The Search for the Red Dragon. The illustrations preceding each chapter are gorgeous, and James A. Owen's writing is plain, simple, and easy to get into. The mystery and dilemma are quickly established and the book has a "young adult" feel in terms of pacing and narrative technique. For example, I expected death to be uncommon in the novel, or at least that death would seldom be directly shown, and that prediction was pretty much on the dot. 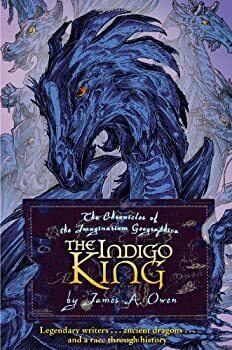 The Indigo King has high aspirations that it sets up in terms of character and a large plot canvas, but doesn't really meet them, though it is a solid work of fantasy. It's major flaws are in its construction: a picaresque pastiche. The pastiche part is a myriad of legendary and mythological sources. On the surface, one might expect such a all-encompassing field of sources ranging from Arthurian legends to Greek mythology to Tolkien and C.S. Lewis and Mark Twain (to name only some) would offer up a rich tapestry of fiction. But the opposite is true — we tend to land on these like a rock skipping across water and so we never really feel present in the mythology; they're never around long enough to awe us. 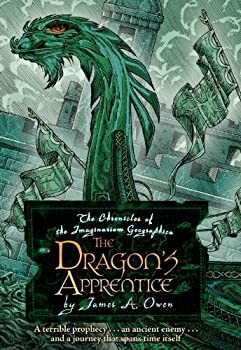 The Dragon’s Apprentice is a delightful blend of historical fiction and urban fantasy. Written specifically for the young adult audience, James A. Owen’s latest installment in The Chronicles of the Imaginarium Geographica is really quite fun. For someone starting the series here, it is easy to adapt to the storyline and enjoy this novel.